I don’t like funerals. I don’t think anybody does. Except funeral homes’ owners, I guess. Here’s another reason to dread funerals…. I received a phone call last week. It was a lady in our church, and she informed me that a beloved church member had passed away. I thought that was it. But there was more. She told me that the widow of the deceased requested her to sing in the funeral service, and she was in turn requesting me to accompany her in the piano. 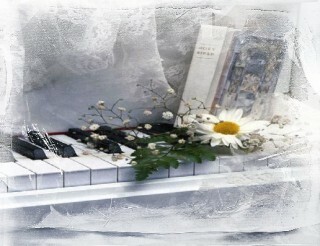 Moreover, she also told me that the widow asked me to play some hymns during the viewing, preceding the funeral service. I was a little shocked by the news, and maybe even more shocked with the thought of playing piano in a funeral. But somehow I agreed to do it, out of respect. I played in church before, just not in a funeral service. This would be my first. I can play the piano, but not very well. To sound good, or at least half-decent, I need to practice a lot, which I admit, don’t do. A year ago, a church member requested me to be the pianist for his wedding. I know the wedding music pieces are difficult and I am fully aware of my limitations. I respectfully declined. I was afraid I will messed up so badly that when I play “Here Comes the Bride,” the guests will be looking at me instead of the bride marching down the aisle. Unlike a recital, or a wedding, or a Christmas program, you have months or at least few weeks to prepare and practice. You don’t have that luxury for a funeral. I got two days. It was not that the two ladies who asked me to play, don’t discern good music. The one who would sing had professionally recorded religious songs in the past, in fact, I even had a music CD of hers. She may not be in her prime, but I would not call her faded, as she still sings beautifully. And the widow? She was the church organist for several decades. She just elected not to play anymore in the past year or so, perhaps due to her age, or maybe more so to give way to the younger musicians. But they had no choice. The three regular and “real” pianists in our church were all on vacation. Two were out-of-state, and one is out of the country. I was the only one available. I could have forced my 13 year-old daughter to take my place, who by the way, already plays better than I do. But I owned up to the responsibility, for the sake of the memory and out of respect of the departed brother. I tell you, do not die when the pianists are on vacation, for you will get a crummy piano player for your funeral. As the time to play came, I just blocked my mind from the audience, and felt the solemn music, and immersed myself on the inspirational content of the hymns I was playing. And as I accompanied the singer with the hymn “Face to Face,” (the song the widow requested to be sang) I don’t think people were focusing on me, nor even on the singer. It was the hopeful message of the song, and the loving memory of the departed that people reflected on. I was grateful that I accepted the part, and contributed to the last memories of our departed brother. I now realized that it is not who plays it, nor how good we play the songs, but it was the songs themselves, and the messages they bring, that touches people. And it is not necessarily our mastery that is important, but our willingness to serve, is what really matters. Ganyan din noon ako nung nasa Pinas pa. Kapag di available ang regular na piyanista ay tinatawag ako. Di ako hi-tech sa pagtugtog pero nakakatugtog naman. Madalas rin akong masalang sa Misa sa patay. Tunay ang sinabi mo sa last paragraph. At tunay na malungkot ang Misa sa atin kung walang choir at piyanista…lalo na kung walang tutugtog sa Misa sa patay. Tinatanggap ko lagi noon ang request para sa Misa sa patay…bilang alay ko na rin sa huling sandali ng namatay sa kanyang Misa. amen to “our willingness to serve”. God can use even the seemingly unusable. Sorry to hear about the funeral, though. I hope that person has received Jesus as his Savior. I play the piano in church, too, whenever I’m asked. I play by ear, I don’t read notes, but like you said, we can just do our best because it’s about our willingness to serve; it’s not about us, it’s about Whom we serve. Superlolongpinoy at Jaz: Pwede na tayong magtayo ng banda….Banda Funeraria 🙂 Salamat sa patuloy na pagbisita. Haha…ok ‘Banda Funeraria’. May banda rin ako dati and we play disco music…kaya puwede ako sa patay at patay-buhay(na ilaw)…hehe. Walang anuman.